When it comes time to invest in an effective marketing tool, you can’t go wrong by choosing new and improved signage. Signs have been used by businesses across a wide range of industries for centuries in order to garner the interest of potential customers and clients. 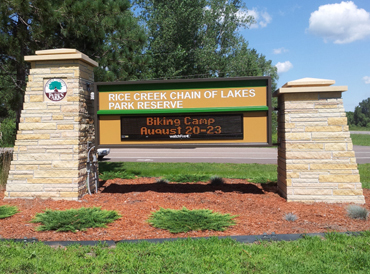 No matter what you are attempting to promote or what message you are trying to communicate, you are sure to find the right sign solution for every endeavor from our local sign company. DeMars Signs is proud to produce a wide range of quality custom signs. Equipped to handle projects of every size and scale, our knowledgeable team works closely with you to deliver signs that show off your business in its best light. Our staff designs, constructs, and repairs all types of signs for many kinds of businesses throughout the area. We boast an in-house neon department, as well as experienced vinyl graphics professionals, which enable us bring even the most complex of your ideas to life. So when you’re ready to upgrade your business signs, trust our licensed, bonded, and insured sign manufacturers to create an amazing product on your behalf. After more than 39 years in business, our commercial sign company has improved upon the services available so that we are able to meet the needs of every client we encounter. Today, we are thus able to create a wide variety of signs for all types of businesses. From simple vinyl graphics to neon-filled glowing masterpieces, we do it all. Our comprehensive staff includes more than 10 professional sign makers who are committed to taking your personal design ideas and bringing them to life in three dimensions. Depend on us to go above and beyond in an attempt to satisfy your every desire. Whether this means sticking to strict budgets, or utilizing out-of-the-box thinking, there’s no one you can trust more than us. Since our inception, we have earned a reputation trusted by countless local businesses, organizations, and groups. Each sign we create follows the strict guidelines set forth by Underwriters Laboratories. As an independent safety science company, Underwriters Laboratories is more than qualified to provide a seal of approval for every sign we manufacture. Our sign experts label each creation to make sure you know that you are receiving an inspected and approved sign sure to meet every safety standard. In addition to having certification with Underwriters Laboratories, we also remain members of the International Sign Association and the Minnesota Sign Association. As members of these prestigious associations, we remain on the cutting edge of sign technology and design ideology. Additionally, our sign company also passes the latest techniques and knowledge on to our customers to help them make educated decisions regarding signage. With countless customizable technology to choose from, the sign possibilities are virtually endless when you work with us. With so many different types of signs now available, determining the right option for your location may be a challenge. This is why, as leading sign manufacturers, we make it our mission to assist you through every step of the sign process. From initial conception to final installation, you can count on us to provide unparalleled guidance every step of the way. When developing signage, we take into account the unique needs and tastes of our clients. Does your neon no longer glow whenever you turn on the sign? Have the elements been harsh on your exterior signage? In addition to designing and constructing signs, our sign manufacturers also perform affordable sign repair services. You can count on us to patch dents, scratches, and holes in your signs, even if they weren’t originally manufactured by us. Accidents occur at a moment’s notice, so we are always prepared to provide the long-lasting repair your sign requires. From quick fixes to permanent resolutions, we do it all. As a part of our repair work, we also offer regular, routine maintenance that helps keep signs in the condition you desire. To learn more about the repair and maintenance we offer, don’t hesitate to consult a member of our team. We are happy to address any questions or concerns you have regarding our services. Each sign we create follows the strict guidelines set forth by Underwriters Laboratories. The signs manufacturers at our company label each creation to make sure you know that you are receiving an approved sign. In addition to having certification with Underwriters Laboratories, we also remain members of the International Sign Association and the Minnesota Sign Association. As members of these prestigious associations, we remain on the cutting edge of sign technology and design ideology. Additionally, we pass the latest techniques and knowledge on to our customers when we create their personalized and customized signage.